Dancer Lucy is usually consigned to the chorus line whenever she works in the theatre, but this Christmas she has a bigger role in the pantomime. She isn't entirely happy with her costume but being in the pantomime means she gets to work with actual celebrities. Lucy has a massive crush on actor Ryan Aspall, who will be playing Prince Charming and Lucy can't help admiring reality star Charmaine, aka Cinderella. She isn't the most talented actress but she puts herself out there and wins the roles, unlike herself who is crippled with fear at the thought of being centre stage. With the fairytale playing out on stage, will Lucy get her happily ever after too? 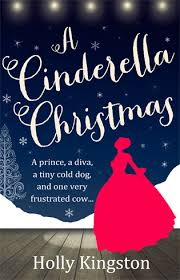 I'd been looking forward to reading A Cinderella Christmas as it sounded like such a fun, festive read (with a gorgeous cover too) and I wasn't disappointed. I was immediately drawn to the character of Lucy, who I thought was a fantastic character and very believable. She's fun and caring but also insecure and needs to stand up for herself, which only made me warm to her more. Lucy thinks Charmaine has taken her under her wing, but it seems Charmaine is taking advantage of her eagerness to please, particularly with her dog, the adorable-sounding Lenin. I loved the feeling of being backstage at the pantomime, watching the story unfold during rehearsals and costume changes. Holly Kingston's writing is light and fun, with some proper laugh-out-loud moments, which makes perfect chick lit reading.